In order to interpret research findings it is critical to compare performance of individuals who have Down syndrome to that of a comparison group. There is debate surrounding the selection of appropriate comparison groups in research with special populations. The aim of matching groups is to rule out potential explanations of group differences. Choosing what to match groups on is driven by the particular research questions being asked and this issue is pertinent to the study of reading given that it is a componential skill. Many studies have included typically developing children matched for chronological age, for non-verbal mental age or on a measure of language or reading ability. Individuals with Down syndrome have also been compared to individuals with learning difficulties of an unknown origin and to individuals who have learning difficulties of a different aetiology (e.g., specific language impairment). The particular measures of language, reading or non-verbal ability used for matching can affect the conclusion drawn. There are also behavioral aspects of the Down syndrome phenotype other than non-verbal ability and language ability (such as motivational style) that may affect their performance on tasks, including attainment tests, and need to be taken into account. In terms of education, there is strong evidence to suggest that the relatively recent policy of educating children with Down syndrome in mainstream schools has had a positive effect on language skills and academic attainments. This means that the findings of studies conducted a number of years ago need to be interpreted with caution. A wide range of factors both intrinsic and extrinsic to the child are known to influence literacy development. Children and young people with Down syndrome attending mainstream schools outperform their peers in special schools in reading and language, emphasizing the role of environmental factors[2,3]. Home environment is also likely to be a critical factor and there is at least anecdotal evidence that the introduction of reading in the pre-school years to children with Down syndrome is beneficial. A dissertation by Ricci suggests that home literacy environment is a predictor of the interest children with Down syndrome have in reading. Moreover, parental beliefs about reading, including their propensity to ask questions during shared reading, predicted children's receptive vocabulary and comprehension skills. However, Trenholm and Mirenda who surveyed the carers of 224 Canadian adolescents and adults with Down syndrome reported that, although there was a wide range of reading materials in their homes, many parents expressed concerns about the availability of good literacy programs. A notable observation was that few parents reported asking any higher-level questions during reading with their offspring suggesting, perhaps, that comprehension aspects may be relatively neglected. It is well-established that phonological awareness, the ability to reflect on the sound structure of speech, is a strong predictor of individual differences in reading skills in typically developing children. Phonological awareness has been assessed in Down syndrome at the level of the syllable, onset and rime and phoneme. An early study by Cossu and colleagues suggested that children with Down syndrome learn to read in the absence of phonological awareness. Subsequent studies have shown that children with Down syndrome have measurable levels of phonological awareness and that although phonological skills are weak, they are nevertheless associated with variations in these children's reading skills[8-12]. It has been suggested that compared to typically developing children, the development of phonological awareness follows a different path in children with Down syndrome. Gombert found that a group of French children with Down syndrome were poorer on tasks of rhyme oddity, rime judgement and phoneme synthesis than on tasks tapping more explicit awareness of phonemes, such as phoneme counting, phoneme spelling and phoneme deletion, in contrast to the findings from typical development. Snowling et al. reported that children with Down syndrome could identify initial sounds in words but found identifying rimes difficult. The observation of a specific deficit in rhyme processing has been replicated by a number of investigators[13,14,15]. There is also a suggestion from some studies that letter sound knowledge is not related to reading or phonological awareness skills as strongly in Down syndrome as in typical development (see ref 11). Together the findings suggest that phonological awareness in Down syndrome is only weakly associated with learning to read and is also poorer than expected based on receptive vocabulary. When non-verbal mental age, rather than receptive vocabulary knowledge, is used to match groups, findings suggest that children with Down syndrome perform worse than controls on tests of rhyme and initial phoneme awareness. Thus, phonological awareness may be out of line with general cognitive ability too. However, there is a note of caution. In the case of Françoise, the single case study (with a relatively high IQ) reported by Rondal, performance on rhyme detection and production tasks was at ceiling and her performance on some phoneme tasks was also good. Similarly, KS, an 8-year-old child with Down syndrome who had been taught to read at an early age, showed well developed phoneme level skills and no sign of a rhyme deficit. She also performed at an age appropriate level on tests of rapid automatised naming and speech rate, attesting to the integrity of speech output processes, and unusually, her verbal as well as non-verbal memory skills were well-developed. Reading skills are often an area of relative strength for individuals with Down syndrome. Most children with Down syndrome acquire literacy skills, although a great deal of variability exists in the level of achievement obtained[9,19-25]. Factors that are associated with reading skills in Down syndrome include cognitive ability, expressive and receptive language skills[16,23,26,27], and phonological awareness [12,21]. It needs to be noted, however, that there is variation in the tasks used and inconsistency across studies, many of which have included children from a variety of school backgrounds. A number of studies suggest that word identification skills develop relatively well in Down syndrome, perhaps suggesting a 'logographic' approach, with decoding abilities lagging behind. In line with this Kennedy and Flynn, and Verruci, Menghni and Vicari reported nonword reading deficits in Down syndrome which were out of keeping with levels of word identification[11,30]. However, Fowler et al. found a significant relationship between nonword reading and word reading, as did Kay-Raining Bird et al.. Furthermore, the exceptional reader KS was a competent nonword reader. In fact, she read nonwords more fluently than age-matched typically developing readers (gaining a standard score of 122), and she had no difficulty reading those without orthographic neighbors, suggesting she was relying on grapheme-phoneme correspondences (see ref 10). Cross-sectional studies of reading are limited in their ability to elucidate the process of reading development. Longitudinal studies allow the investigation of growth in reading and phonological skills over time and have greater potential for exploring causal relationships. Byrne et al. 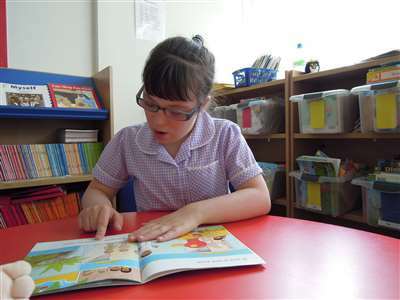 followed a group of 24 children with Down syndrome who attended UK mainstream schools over two years and compared their progress with that of a group of average readers and a group of slow readers from the same classrooms. The group of typically developing average readers performed at higher levels on all language, literacy and memory measures and also progressed significantly more in all areas over the two years than the children with Down syndrome did. The children with Down syndrome made steady progress in reading accuracy but their progress on measures of reading comprehension, language, spelling and memory was more limited. Kay-Raining Bird, Cleave and McConnell followed the development of reading skills in a small group of 12 children with Down syndrome over four and a half years. They found improvements in word identification skills over time and there was an advantage of word reading over nonword reading. They also monitored the development of phonological awareness. There was no improvement in segmentation skills over the years but spontaneous rhyming skills improved steadily. Similar findings have been reported by Hulme, Goetz, Brigstocke, Nash and Snowling, who followed 55 children with Down syndrome aged 5 to 16 years (mean age 9;11) over a period of two years, assessing them at three points in time. Their progress was compared to that of a comparison group of 61 typically developing children matched for reading ability but of higher verbal and non-verbal ability. Despite starting out with similar levels of word recognition, the children with Down syndrome made significantly less progress in reading accuracy over time than the typically developing group and in particular, their nonword reading skills lagged behind. Among typically developing children, the predicted relationship between phonological awareness and reading development was found. However, among children with Down syndrome it was a measure of receptive vocabulary that predicted reading rather than phonological awareness. Similarly, Byrne et al. found that reading in their Down syndrome group was associated with understanding of grammar and auditory memory. Laws, Nye, Lombard and Briscoe reported preliminary findings from a study comparing the reading and language skills of children with Down syndrome with those of children with specific language impairment and children with specific reading difficulties. The groups were of similar age (8-9 years) but varied in IQ and language skill. There was considerable overlap between the reading scores of the children with Down syndrome and those with specific reading difficulties. However, levels of letter knowledge and of phonological awareness were significantly lower in the Down syndrome group than in matched subgroups of children with specific language impairment and specific reading difficulties, especially in rhyme awareness where few of the children with Down syndrome scored above chance. One plausible reason that children with Down syndrome are better at reading than predicted by their oral language skills is that they have relatively good visual skills (e.g. ref 9). Fidler, Most and Guiberson explored the relationship between reading skills and visual perception in 29 children and adolescents with Down syndrome and 20 with learning difficulties of mixed origin. The two groups were matched for age and non-verbal mental age, and subsequently found to be equated in reading skill. Participants were administered tests of visual memory, figure-ground discrimination, spatial relationships, visual closure and visual discrimination. There was a significant correlation between a composite score on the perceptual tests and word identification in the group with Down syndrome (r=.66) but not in the group with mixed aetiologies r=.23). When age was controlled, visual processing skills accounted for 34% of the variance in word identification in the group with Down syndrome. The high incidence of mild to moderate hearing loss associated with Down syndrome might in principle affect the development of phonological awareness and reading skills. However, although one study found that a group of children with Down syndrome who could read differed in their hearing thresholds from a group of children with Down syndrome who were not able to read, other studies found no association with either phonological awareness or reading levels [14,34]. Reading comprehension in Down syndrome has attracted much less research interest than decoding ability; however it presents a significant area of difficulty for individuals with Down syndrome[21,30,31,35]. Boudreau showed that reading comprehension and decoding skills were less well developed in a group of young people with Down syndrome compared with a younger group matched on non-verbal mental age. However, both word identification and passage comprehension were predicted by measures of receptive vocabulary, sentence memory and MLU (Mean length of utterance). Similarly, Fowler et al., and Laws and Gunn reported relationships between language and reading comprehension in children with Down syndrome as in typical development[9,21]. In the case of the exceptional reader described by Groen et al., comprehension for literal facts was within the normal range but she had significant difficulty answering comprehension questions that required her to make knowledge-based inferences; in general, her reading comprehension was in line with wider language comprehension skills. In summary, reading comprehension appears to lag behind accuracy in Down syndrome because it is limited by language skills. In a small scale study, Kennedy and Flynn evaluated whether phonological awareness training would improve grapheme-phoneme skill and lead to clearer speech production in a group of three children with Down syndrome (using an intervention program devised by Gillon). Following eight one-hour intervention sessions the children gained higher scores on alliteration matching and spelling tasks, though no statistics were reported to ascertain whether these increases were statistically significant. The spelling data suggested that over the course of the intervention, participants moved from an awareness of initial sounds to an awareness of final sounds. The increase in phonological awareness did not generalise to the phoneme segmentation task, suggesting that children with Down syndrome need to be specifically taught the phonological awareness skills needed for fluent decoding. This study found no positive effect of training phonological awareness on speech production. Van Bysterveldt, Gillon and Moran evaluated the effects of a six week phonological awareness training program on seven 4-year-old children with Down syndrome. The intervention involved training parents to bring their children's attention to letters and sounds in words, and to initial phonemes during daily shared reading activities. There were improvements in phonological awareness and letter knowledge, and knowledge of phonemes depended upon whether or not the child knew the particular letter that represented the phoneme. The findings of this study suggest that phonemic awareness may be a consequence of letter learning in Down syndrome (however, Hulme et al., did not replicate this item-specific effect). Like other children with intellectual disability, children with Down syndrome are often taught to read using a 'sight word' or 'Look and Say' approach, in which they learn to associate whole printed words with their spoken forms. An obvious limitation of the sight word approach is that it does not equip the child with strategies that enable him or her to read untrained words. An alternative approach to reading instruction is 'word analysis' or 'phonics'. In an earlier review of research on reading instruction for children with moderate mental retardation, Conners suggested that a word-analysis approach is feasible and appropriate for this population. In line with this view, Farrell and Elkins reported findings from a group of children with Down syndrome who could use 'the alphabetic principle' in reading and writing and who attended to the forms and sounds of words. A direct comparison of two instructional techniques for teaching oral reading skills to children with Down syndrome was undertaken by Cupples and Iacono. In this study, four children were taught using a whole-word (look and say) approach and three children were taught with a word-analysis approach in which children were taught to read monosyllabic words by combining the phonological units of onset and rime. After 6 weekly sessions lasting approximately 45 minutes, 4 out of the seven children (2 from each intervention group) showed measurable improvement in reading the trained words. Only two children from the word-analysis group were able generalise their skills and showed an improvement in reading a set of untrained words (note though that these words had the same rime unit as the trained words). Baylis conducted a small-scale training study using a program designed to develop the emergent literacy skills of 10 children with Down syndrome who possessed some letter sound awareness but did not use this knowledge to decode unfamiliar words in their reading. The program was an adaptation of the 'reading and phonology' approach developed by Hatcher, Hulme and Ellis. Children were seen individually for two one-hour sessions a week (for 9 weeks) in which they received training in phonological awareness at the onset-rime level incorporated into a program of text reading encouraging letter knowledge, syllable segmentation skills, comprehension, spelling and writing. The onset-rime level of phonological awareness was chosen because of the inability of the children to blend at the phoneme level and because it was considered this would reduce the memory load placed on the children by presenting 'chunks' of words rather than individual phonemes. Each of the ten children in the study acted as their own control and performance on tests of reading and phonological awareness was assessed twice before the intervention began to provide baseline measures (t1, t2), the week following the last teaching session (t3) and three months after the end of the teaching sessions (t4). All ten children made gains in letter recognition and word recognition and in a measure of book reading performance, though progress was quite variable across the group. Gains in phonological awareness were much less consistent, with some children showing gains and others showing deteriorations in performance. For 6 of the 10 children gains were larger than to be expected when compared with the progress made by a larger cohort from which the children were drawn. Along similar lines, Goetz, Hulme, Brigstocke, Carroll, Nasir and Snowling delivered a modification of the Hatcher et al. approach, training phonological awareness in the context of learning letters sounds and working with words in books. In this study, phonological awareness training was targeted at the phoneme level; the program also incorporated sight word learning activities and speech production exercises that focused the child's attention on articulating sounds in words and perceiving sound contrasts as well as decoding strategies. Eight children with Down syndrome received the intervention for a period of 8 weeks (Group 1; delivered on a daily basis in a 40-minute one to one session) before intervention for a further 6 children in a 'waiting list' control group (Group 2) commenced. Group 1 made significantly more progress in letter and word recognition during the period when they received intervention compared to the waiting control group; effect sizes were large for Word Reading (Cohen's d = 0.80) and moderate for nonword reading (Cohen's d = 0.4). The waiting group started to make progress once their intervention began and overall, children progressed more in word reading skills over the duration of the intervention than they did when they did not receive this intervention program. Progress in phonological awareness was modest; although there was significant progress in alliteration matching during the intervention, the majority of the children remained at chance on tests of explicit phoneme awareness. This finding contrasts with that from case studies reported by Cologon, Cupples and Wyver who compared the effects of instruction in phonological awareness (through oral reading) and reading comprehension (through silent reading) in a sample of 15 children with Down syndrome aged between 2;11 and 10;8 years. The phonological awareness intervention trained decoding skills at the onset-rime level and individual phoneme level combined with picture matching and sentence completion tasks. The reading comprehension or 'silent reading' intervention trained word and picture matching, sentence and picture matching, action sentence tasks and sentence completion tasks. Participants were seen individually in a weekly session for 10 weeks. They were assessed pre-intervention, immediately following completion of the intervention and for maintenance testing six months later. Although there was considerable variation in progress across children, all demonstrated significant gains following the intervention. Participants in the phonological awareness intervention condition showed significant improvement on measures of phonological awareness, phonic decoding, letter-sound knowledge and reading comprehension. Participants in the silent reading intervention condition showed significant improvement on measures of reading comprehension, reading ability, phonological awareness and letter-sound knowledge. Finally, a number of other small scale or pilot studies are in progress for children with Down syndrome. These include an intervention to promote literacy stimulation during joint book reading which has positive effects and an intervention program to promote reading comprehension strategies. Research on literacy development in Down syndrome has burgeoned in recent years, though study remains focused on word level decoding abilities and phonological skills with a relative neglect of spelling and reading comprehension processes. Both areas of enquiry could offer important insights into the relationships between speech and language skills, specific forms of linguistic representation and written language abilities. In addition, the majority of research remains small in scale, often involving children and young people widely ranging in age and there is a dearth of longitudinal studies. Moreover, relatively few comparisons have been made between the literacy skills of children with Down syndrome and those with learning difficulties of mixed aetiology. The picture that emerges is that of considerable variation in the reading attainments of children with Down syndrome. The extent to which this is the outcome of constitutional versus environmental factors is uncertain. It appears that verbal rather than non-verbal mental age is a predictor of individual differences in word recognition in Down syndrome but nonetheless, word-level reading skills are generally in advance of what might be predicted given receptive vocabulary knowledge. In terms of component reading skills, levels of phonological awareness and decoding ability are generally lower than levels of word identification (but they are related and there are some exceptions) and the majority of children with Down syndrome have poorer reading comprehension than reading accuracy, probably due to language limitations. A consistent finding across studies is of difficulties in rhyme recognition and awareness in this population suggestive of atypical development of phonological skills. With these findings as a back-drop, a number of small-scale intervention studies have evaluated the effects of programs targeting phonological awareness and reading skills. Most of these studies report very short-term interventions, few have included control groups and none have used randomized trials. The picture emerging to date is that word recognition skills are more amenable to training than phonological awareness skills or decoding abilities but more research is required to clinch this issue. Finally it should be emphasized that, just as in the general population, there is variance in ability in Down syndrome resulting from genetic differences and differences in the environments through which genes act. Individuals with Down syndrome inherit a full set of chromosomes from their parents, as typically developing children do, along with the extra chromosome material. They also experience a wide range of environments at home and in school that will contribute to their literacy outcomes. There is an urgent need for longitudinal studies that follow the development of literacy in Down syndrome from before the start of formal schooling and that map relations between their general cognitive abilities, language and reading skills. Such studies should also investigate environmental influences on literacy. Findings from these studies will inform individual difference in responsiveness to intervention in Down syndrome. Laws G, Byrne A, Buckley S. Language and memory development in children with Down syndrome at mainstream schools and special schools: a comparison. Educational Psychology. 2000;20(4):447-457. Ricci L. Home literacy environments, parental beliefs about reading, and the emergent literacy skills of children with Down syndrome. Dissertation Abstracts International: The Humanities and Social Sciences. 2004;64:2161-A. Cossu G, Rossini F, Marshall JC. When reading is acquired but phonemic awareness is not: A study of literacy in Down's syndrome. Cognition. 1993;46:129-138. Cardoso-Martins C, Frith U. Can individuals with Down syndrome acquire alphabetic literacy skills in the absence of phoneme awareness? Reading and Writing. 2001;14(3-4):361-375. Fowler AE, Doherty BJ, Boynton L. The basis of reading skill in young adults with Down syndrome. In Rosenthal D, Nadel L, editors. Down syndrome: Living and learning in the community. New York: Wiley-Liss;1995. p.182-196. Gombert J-E. Children with Down syndrome use phonological knowledge in reading. Reading and Writing. 2002;15(5-6):455-469. Kennedy EJ, Flynn MC. Training phonological awareness skills in children with Down syndrome. Research in Developmental Disabilities. 2003;24:44-57. Snowling MJ, Hulme C, Mercer RC. A deficit in rime awareness in children with Down syndrome. Reading and Writing. 2002;15(5-6):471-495. Cardoso-Martins C, Michalick MF, Pollo TC. Is sensitivity to rhyme a developmental precursor to sensitivity to phoneme? : Evidence from individuals with Down syndrome. Reading and Writing. 2002;15(5-6):439-454. Hulme C, Goetz K, Brigstocke S, Nash H, Snowling M. Development of Reading and Phonological Awareness in Down Syndrome. University of York; in preparation. Nash HM. Semantic and phonological processing in Down syndrome. University of York; 2007. Boudreau D. Literacy skills in children and adolescents with Down syndrome. Reading and Writing. 2002;15(5-6):497-525. Rondal JA. Exceptional reading development in Down syndrome. Cambridge: Cambridge University Press; 1995. Groen M, Laws G, Nation K, Bishop D. A case of exceptional reading accuracy in a child with Down syndrome: underlying skills and the relation to reading comprehension. Cognitive Neuropsychology. 2006;23:1190-1214. Buckley S, Bird G, Byrne A. Reading acquisition by young children. In: Lane D, Stratford B, editors. Current Approaches to Down's Syndrome. London: Holt, Rinehart and Winston; 1996:p.315-343. Kay-Raining Bird E, Cleave PL, McConnell L. Reading and phonological awareness in children with Down syndrome: A longitudinal study. American Journal of Speech-Language Pathology. 2000;9(4):319-330. Laws G, Gunn D. Relationships between reading, phonological skills and language development in individuals with Down syndrome: A five year follow-up study. Reading and Writing. 2002;15(5-6):527-548. Sloper P, Cunningham C, Turner S, Knussen C. Factors related to the academic attainments of children with Down's syndrome. British Journal of Educational Psychology. 1990;60:284-298. Snowling MJ, Gombert J-E. Introduction to Special Issue: reading and language in Down syndrome and Williams syndrome. Reading and Writing. 2002;15:433-437. Carr J. Down's Syndrome: Growing up. Cambridge: Cambridge University Press;1995. Lorenz S, Sloper T, Cunningham CC. Reading and Down's syndrome. British Journal of Special Education. 1985;12:65-67. Frith U. Beneath the surface of developmental dyslexia. In: Patterson KE, Marshall JC, Coltheart M, editors. Surface Dyslexia. London: Routledge and Kegan Paul; 1985. Buckley S. Attaining basic educational skills: reading, writing and number. In: Lane D, Stratford B, editors. Current Approaches to Down's Syndrome. London: Holt, Rinehart & Winston; 1985: p. 315-343. Verruci L, Menghni D, Vicari S. Reading skills and phonological awareness acquisition in Down syndrome. Journal of Intellectual Disability Research. 2006;50:477-491. Byrne A, MacDonald J, Buckley S. Reading, language and memory skills: A comparative longitudinal study of children with Down syndrome and their mainstream peers. British Journal of Educational Psychology. 2002;72:513-529. Laws G, Nye J, Lombard F, Briscoe J. Reading development of children with Down syndrome, children with specific language impairment and children with specific reading difficulties. Paper presented to the International AFASIC symposium, Warwick, UK; 2007. Fidler DJ, Most DE, Guiberson MM. Neuropsychological correlates of word identification in Down syndrome. Research in Developmental Disabilities. 2005;26(5):487-501. Moni KB, Jobling A. Reading-related literacy learning of young adults with Down syndrome: Findings from a three year teaching and research program. International Journal of Disability, Development and Education. 2001;48(4):377-394. Gillon GT. The efficacy of phonological awareness training for children with spoken language impairment. Language Speech and Hearing Services in Schools. 2000;31:126-141.
van Bysterveldt A, Gillon GT, Moran C. Enhancing phonological awareness and letter knowledge in preschool children with Down syndrome. International Journal of Disability, Development and Education. 2006;53:301-329. Conners FA. Reading instruction for students with moderate mental retardation: Review and analysis of research. American Journal of Mental Retardation. 1992;96:577-597. Farrell M, Elkins J. Literacy for all: The case of Down syndrome. Journal of Reading. 1995;38: 270-280. Cupples L, Iacono T. The efficacy of 'whole word' versus 'analytic' reading instruction for children with Down syndrome. Reading and Writing. 2002;15(5-6):549-574. Baylis P. Reading Skills in Down Syndrome. University of York; 2005. Hatcher P, Hulme C, Ellis AW. Ameliorating early reading failure by integrating the teaching of reading and phonological skills: The phonological linkage hypothesis. Child Development. 1994;65:41-57. Goetz K, Brigstocke S, Snowling MJ, Carroll J, Nasir L, Hulme C. Training reading and phoneme awareness skills in children with Down syndrome. Reading and Writing. In press. Bowyer-Crane C, Snowling MJ, Duff FJ, Fieldsend E, Carroll JM, Miles J, Götz K, Hulme C. Improving early language and literacy skills: Differential effects of an oral language versus a phonology with reading intervention. Journal of Child Psychology and Psychiatry; in press. Cologon K, Cupples L, Wyver S. The development of phonological awareness, phonic decoding skills and reading comprehension ability in children who have Down syndrome: Results from an intervention study. Paper presented to the Australasian Human Development Association XVth Biennial Conference, Sydney, Australia; 2007. Fries B. The effects of joint book reading emphasizing print focus on print awareness in preschool children with Down syndrome: a preliminary investigation. Dissertation Abstracts International: The Humanities and Social Sciences. 2004;65:114-A. Work towards this review was funded by a British Academy Readership to MS, a grant for the Health Foundation and ESRC studentships to HN and LH. Thanks to Charles Hulme and Kim Manderson for assistance at various stages. Margaret J Snowling, Hannah M Nash and Lisa M Henderson are at the University of York, UK. Received: 17 January 2008; Accepted: 24 January 2008; Published online: 2 July 2008.